Delilah's, tucked in the Lakeview neighborhood in northern Chicago, is a 16-year-old watering hole, established by owner Mike Miller to deliver the "anti-boring." 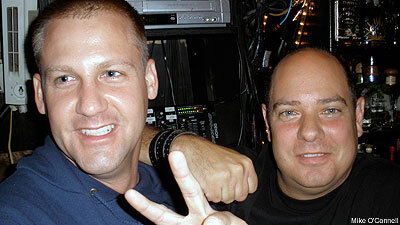 On the first Tuesday of each month, Delilah's offers The Metal Shop, the city's longest-running DJ event, hosted and produced by music industry vet Ron Platzer, pictured above right, flanked by Guest DJ and Terror vocalist Scott Vogel to his left, who has had tenures at Victory Records and Jeff McClusky & Associates. "It's a real honor", Platzer told Noisecreep about the gig. "I live for metal and hard rock and am proud to be providing the monthly vehicle for Chicago headbangers to raise their fists and raise their glasses." Delilah's is part biker bar, part art gallery. The two-story building was erected in 1919, and according to Platzer, "could easily pass for a haunted housed. On any given night, as you make your way through the black-on-black entrance, your senses are tingled by a feast of music and '60s and '70s cult films." Offering 400 varieties of whiskies and 300 beers, Delilah's has themed nights from Monday through Friday. "One night, it's punk rock and the next is alt-country or ska/oi," Platzer explains. "I deliver the metal." Metal Shop is a five-hour event, with each edition built around a specific feature, such as a new release or a forthcoming high profile show -- or even the anniversary of an iconic release. Anywhere from 75 to 100 Chicago rockers pile in to hear new tunes as well the oldies but goodies. "What I attempt to do with Metal Shop is to uphold the tradition of the event," Platzer said. "Next, I try to put myself in the place of the participants. What do they want to hear? I keep the event interactive and remind everyone that this is their Metal Shop. They help select the music; I just play the songs." Sometimes, Platzer has a little help from friends, like Dirge Witin's Shaun Glass or local radio personalities like Scott Davidson of the long-running Rebel Radio program. Platzer's impressive industry background and long-running relationships afford him the ability to provide Chicago metallions with some treats and to give labels, managers and bands another avenue in which to be heard. Platzer said, "The music business is in the toilet, but metal is unique in that the fans are passionate and devoted, and Chicago metal fans are passionate about metal. I consider myself an ambassador for the music, and I'm as big of a fan as you'll ever meet." Trust us, he's the biggest Kiss fan you'll ever cross paths with. Some of jewels in the Metal Shop crown have happened recently. "The Slayer release party for 'World Painted Blood' was incredible," Platzer said. "We gave away a Slayer motorcycle helmet and played the new CD all night." Last month's feature was the 30th anniversary of 1980 and the new wave of British heavy metal. Other recent features include the Chicago premiere of 'Anvil! The Story of Anvil,' the Iron Maiden 'Flight 666' film, the Rob Zombie 'Hellbilly Deluxe 2' release party and the Anthrax 'Spreading the Disease' reissue. So if you are a headbanger and reside in the Windy City, mark your calendar every first Tuesday for a date at Delilah's. You may even rub elbows with some notable rockers, as Anthrax's Scott Ian and Charlie Benante, Metallica's Robert Trujillio, Slash and Ministry's own -- and Chicagoan -- Al Jourgensen have all stopped by. Platzer theorizes that Metal Shop is so successful because of Chicago's blue-collar ethic. "It's a very working class, rock 'n' roll city. Chicago knows how to rock and if anything I did were fake or disrespectful, it wouldn't last a month," he said. "Second, I feel like there's a very vibrant and flourishing metal scene here. Bands like Bible of the Devil, Skeletonwitch, Earthen Grave, Black Cobra, Dirge Within, Minsk and Pelican are producing some of the most meaningful progressive metal anywhere and they all call Chicago home. "I encourage local bands, signed and unsigned, to come to Metal Shop for airplay and to promote upcoming shows. Finally, I am severely dedicated to upholding a level of professionalism and passion to Metal Shop. I take this role very seriously, and I put a lot of work into this every month. But come that Tuesday night, it's all fun."